Basically, the insanity began as a cover band in April of 1989 under the name Beyond Infinity in the small town of Wendell, NC. John Snead(drums),Ritchie Owens(bass),Mark Moore(vocals), Andy Pitre(Guitar) auditioned for another guitarist (Brent Smith) and started playing covers of Metallica, King Diamond, Metal Church, Slayer, Anthrax,etc. Playing a dance club and a Battle of the Bands for that year was not enough to keep busy, Ritchie Owens was replaced by Jeff Stegal and the band starting to write originals (Bedbugs,The Killer Awaits, and Death Be Not Proud). With Brent Smith leaving briefly, the band talked him back to play another Battle of the Bands(1990) playing all the originals and "Angel of Death" by Slayer to close the set. Due to personal differences Jeff Stegal was dropped and so were the originals (The Killer Awaits and Death Be Not Proud), which were mostly Stegal's creations. The band started to record its first demo in Garner, N.C.. Going in a more technical thrash direction, They recorded 3 songs: Bedbugs, Infernal, and Judge Not. The demo was never released. Mark Moore left the band at the end of the summer, eventually (in 94') him and Ritchie Owens started Surreal(a Doom Metal Band) . In 91' going through several different name changes (Sacrament,Judgemental)John,Andy and Brent decided to each handle the vocal duties for a TRIPLE VOCAL ATTACK. They got Mike Patrum on bass and the band started to go in a more Death direction. They changed the name to Debauchery and recording a 2 song (never released) demo with the songs Quarantine and Non-Terminus. The band landed its first gig in December of 91' at the Fallout Shelter in Raleigh. They did a few gigs in Washington D.C., Manassas,VA, and Winston Salem,NC building a small local following. Mike Patrum was "let go" due to personal differences and Jeff Fischer filled in for about a month before joining Eldritch Horror. 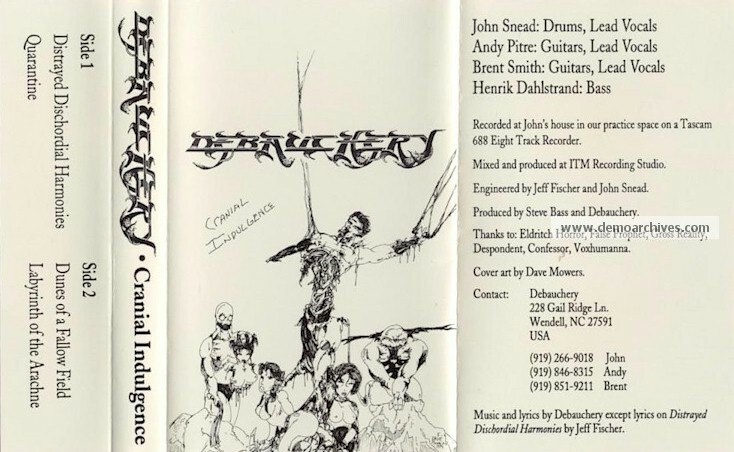 Debauchery started to record their "Cranial Indulgence" demo with 4 songs on a 8 Track recorder at their practice space (assisted by Jeff Fischer). Hendrik Dahlstrand(A Swede) joined the band. The band got some gigs with Seducer and some other local bands beginning 1993 and the Cranial Indulgence demo was finally released. The band got on Relapse's Distro list and starting doing lots of international mailing for trades on the demo and getting the name around. The band also released one track from the demo: "Labyrinth of the Arachne" on King Fowley's With your Teeth records for his Death Metal Compilation. Hendrik had to go back to Sweden and the band played its last 3 gigs without a bass player. John Snead had been suffering from Carper Tunnel Syndrome and eventually he couldn't play anymore. The band disbanded in early 1994.